Cimarron girls captured top honors at their own meet. 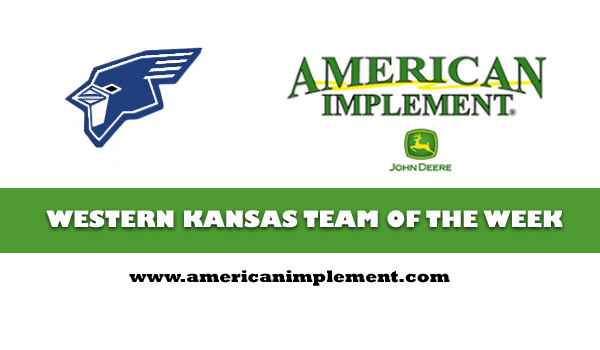 This weeks Western Kansas Team of the Week from American Implement is the Cimarron High School Girls Track and Field Team. The Bluejays won their own meet this past week on Friday by scoring 103.5 points edging out second place Meade HS by 11.5 points. Clara Bartlett picked up titles in the 400 and 800 for the Bluejays. Jacee Wilson (Triple Jump) and Macy Fugitt (High Jump) also picked up first place finishes. The 4x800 relay team also finished in first place. American Implement would like to congratulate Cimarron on their girls team title at the Cimarron Invitational.